For spring, that is. And neither can these unmistakable markers of spring in my garden. Let's start with the little daffodil. I don't know the name of this one as they came with the yard when we moved here (and survived the Great Landscape Makeover of 2006). But it's the same type as are blooming in the interstate median, along the highways, and in abandoned lots. The same type as in my header photo, taken not too far from our town. They're somewhat small and dainty but obviously hardy. My fancy store-bought daffodils are still taking their sweet time when it comes to blooming. 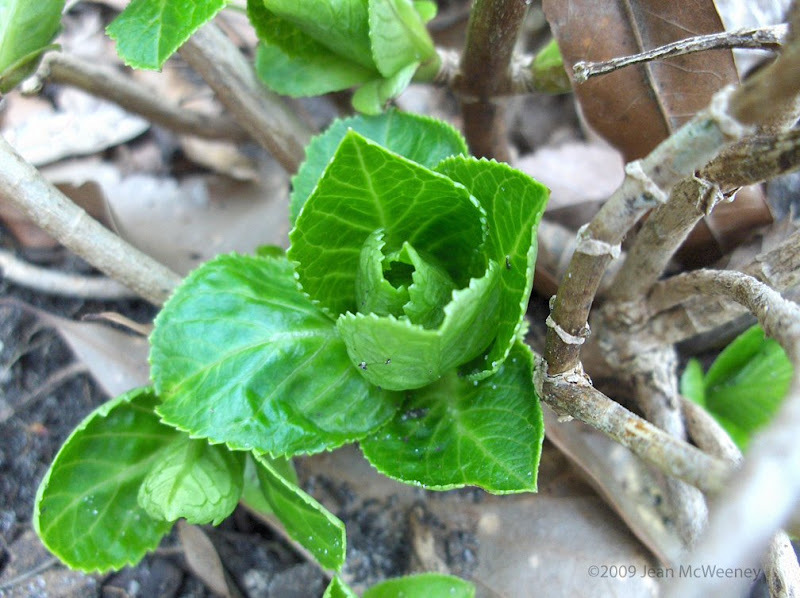 The "Mini-Penny" hydrangea is putting out its spring growth. You go girl! I just love the way the periwinkle (Vinca major) looks like it has a flower within a flower (look closely). These grow wild in my former alleyway. Obviously hardy if they can grow on asphalt and a little bit of humus! 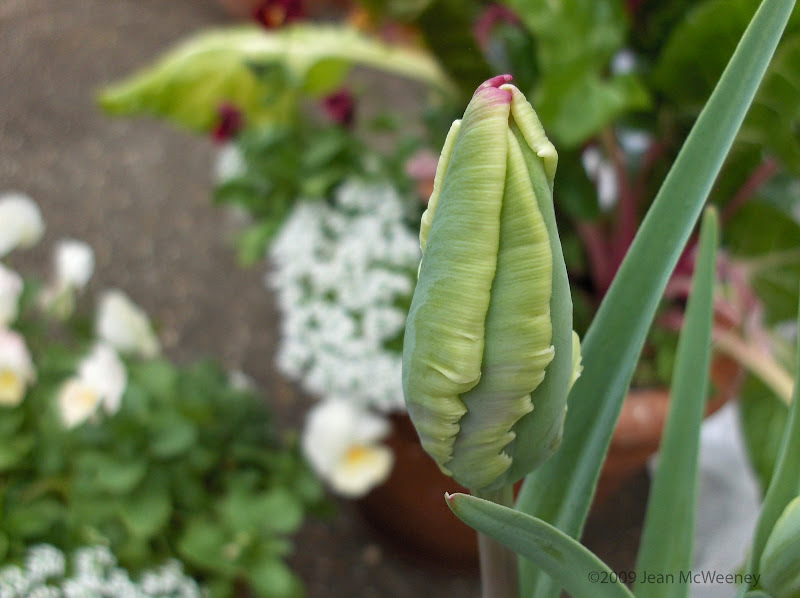 And here's a promise of cool spring things to come, a tulip about to open. You'll be seeing more of that in future posts I'm sure. Those are some fantastic close-ups of fabulous blooms. Nice blog. I look forward to visiting again! Hi Jean, that was really a teaser with the tulip shot! It promises to be a beauty, since they all are. :-) Your bluebonnets look so healthy and lush. We cannot grow them here at all, the soil is too acidic I believe, or something. I have tried several times and the seed will germinate then the poor things struggle and die. Yours are wonderful. Maybe I should try a pot! It looks like things are about to pop. My blue (er, pink) bonnets are budding up too, with a few already in bloom. Now that's a true sign of spring for a Texan. Good heavens - nearly tulip time - we have a while to go before that. I hear you dear Garden Friend .... I can't wait till spring. This is a wonderful blog and I want to thank you for warming up my 'blah' winter up NORTH! Looking forward to some more great posts from you. Stop by my garden sometime. Great photos in this post as usual. I get a bounce in my step as I see signs of spring! Bring it on, the sooner the better. Such gorgeous and colorful photos! I just picked up some bluebonnets a few days ago and already have them planted. Looking at your garden you can tell that spring's definitely on its way! I always end up with some plants--like your daffodil--that I have no names for. 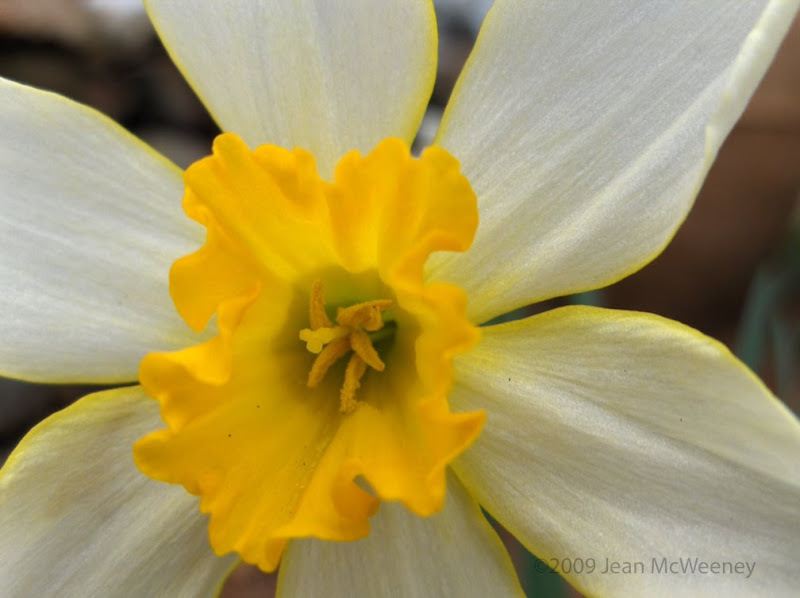 "Early daffodil" works just fine, especially when it's the first of its kind for the season. I forgot to mention in my other comment. I saw your question on changing the size of your header photo and uploading large pics. If you'd like help with the header on my blog look at the Table of Contents. I think I have a tutorial on it. But you're using a stretch template so it will be a little different. You don't have an email available so feel free to use the contact form to send me a message and I'll see about helping you with the header and larger image problem if you need help. 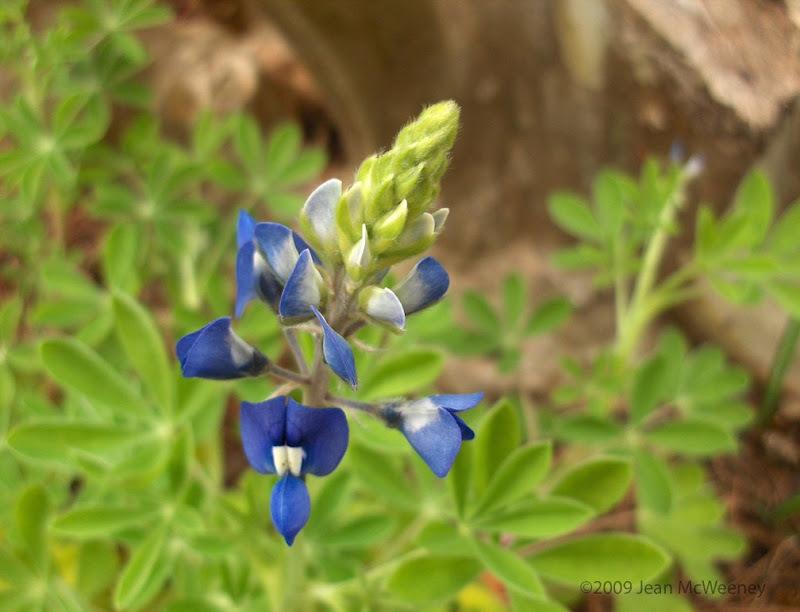 I just planted TX Bluebonnet seeds and am seeing if they are going to live or die. They look a bit 'fragile' in your photo...who knows whether they'll make it to a full plant...then comes the actual 'blooming' part!! 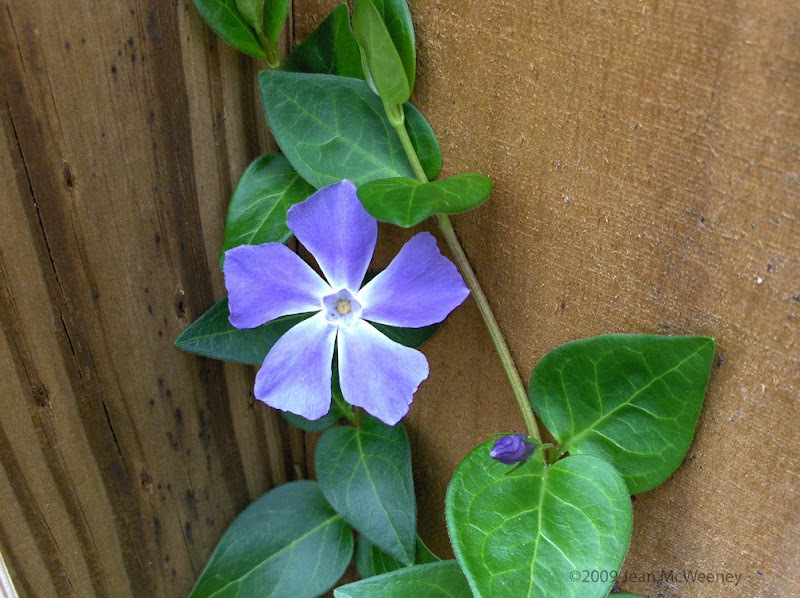 I have loads of Periwinkles all over a shady area in my yard...they look lovely when they bloom. They're a good ground cover too but need thinning around here. I just bought some tulips and daffs and even other spring blooming bulbs, that were already above ground and ready to bloom. I'm going to put them in today (hopefully) and then perhaps next year they'll come up again. I didn't put any in during the fall so if these don't go in, I'll have no tulips, etc. in my garden:( Can't have that, right;) ! 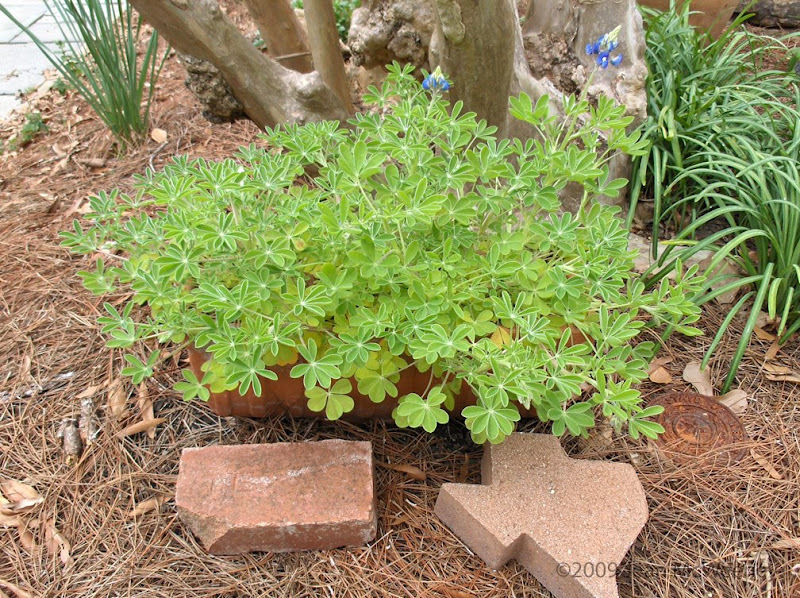 Frances and Gail - maybe you should try bluebonnets in pots?? James - that Texas brick came from the old Sears store in Austin that was torn down. My friend made a whole patio out of them! Mr. BT - thank you for your offer of help and your very helpful blog! I hope to work on that in the next couple of days. Oops! James, I thought you meant the brick to the left of the cast concrete one (don't know what I was thinking). Anyway, might be hard to make a whole patio out of that, at least for the state of Texas! Maybe a rectangular state would work. ;-) That cast concrete stone was mysteriously left there one Christmas. It took 6 months before I found out a former neighbor from Texas dropped it there on his way through the state! Oh - I love tulips - it is amazing to think that you have one in bud - we have a long way to go before that time. It's been a while since I visited your blog - and the photos are gorgeous! I especially love the photo on the banner - is that YOUR garden? If so - you are so lucky to have such a wonderful site. Chloe - no, that's not my site in the banner photo. :-) But it's not that far from my town. I've heard the barn has since been torn down unfortunately. Thanks for visiting!